Despite the holiday excitement that is coming upon us, I couldn't enjoy it because of the great sadness I felt for Newtown this weekend. Now that I have my own little one, I can't imagine what the parents of those poor children are feeling right now. My heart goes out to them for their loss and tragedy. May the innocent victims rest in peace. I used Nails Inc Floral Street as my white base and topped it with my Snowman Sparkle polish topper by Sally Girl that I received in my Secret Santa gift. There's a pink shimmer to it but it was difficult to capture. 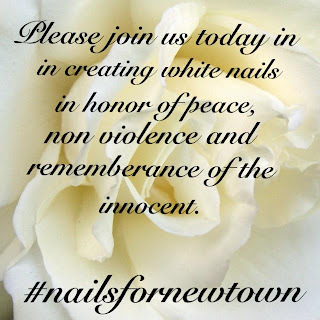 I am proud to be apart of a community that bands together to show their support for those in Newtown who are currently suffering from so much tragedy and loss. If you'd like to share your support, please use the inlinkz codes found here.